Have you ever wondered how your commercial auto insurer calculates your auto liability and physical damage premiums? Most insurers utilize a classification and rating system developed by the Insurance Services Office (ISO). This article will explain the elements of this system, and how they affect your commercial auto premiums. Insurers or rating agencies often divide states into geographical subdivisions called rating territories. Each rating territory has characteristics that set it apart from the others. For instance, one territory may be largely rural while another is metropolitan. Similarly, one territory may have a higher rate of vehicle thefts than another. Rating territories reflect differences in risk. Traffic congestion and crime are common in densely populated areas. Thus, rates are generally higher in urban areas than in rural communities. A vehicle is assigned the rating territory of the place where it is garaged. Note that the rating territory is unrelated to the policy coverage territory. Under a commercial auto policy, vehicles are subject to either fleet or non-fleet rates. Fleet rates are typically lower than non-fleet rates. A fleet normally consists of five or more self-propelled autos (such as trucks or tractors). A trailer is not self-propelled, so trailers are not included in the vehicle count. However, trailers are eligible for fleet rating if a policyholder owns five or more vehicles that are self-propelled. If you aren't sure whether your vehicles are rated as a fleet, check with your agent or broker. There are two basic categories of vehicles used for business. One consists of trucks, tractors, and trailers. The second group consists of private passenger type autos (cars). The rating of trucks, tractors, and trailers is based on several factors. These include the vehicle's size, the manner in which it is used, and the distance it travels. Under the ISO classification system, trucks are categorized into size classes based on their gross vehicle weight (GVW). The GVW is determined by the manufacturer. It is the weight of the truck when loaded to its capacity with people and cargo. Depending on its GVW, a truck might be classed as light, medium, heavy, or extra-heavy (see the table below). A small pick-up truck would likely be classified as a light truck. A large garbage truck, on the other hand, might qualify as an extra-heavy truck. Large trucks have more mass than small ones. If a large truck collides with another object, it is more likely than a small truck to cause serious bodily injury or property damage. For example, suppose an extra-heavy garbage truck and a pickup truck are both traveling at the same speed. Each vehicle runs a stop sign and rear-ends a private passenger vehicle. Because the garbage truck has a much greater mass than the pickup truck, it will likely cause more damage to the car than the pickup. A large truck is also more likely than a small one to cause severe injuries to passengers. In the above example, the garbage truck is more likely than the pickup truck to injure passengers in the private passenger vehicle. 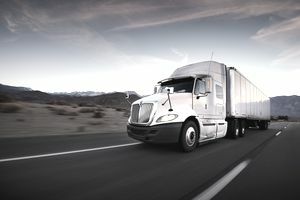 Thus, as the size (gross vehicle weight) of a truck increases, the rate charged for liability coverage increases as well. The weight of truck-tractors is expressed in terms of gross combined weight (GCW). This is the weight of a fully loaded tractor and the trailer combined. The GCW includes the weight of passengers and cargo. Trucks are also assigned a use class, which may be service, retail or commercial. A truck is classified as service use if it is primarily used to transport tools and equipment to job sites. For example, a plumbing contractor owns three pickup trucks that company employees use to travel to job sites. The trucks are classified as service use because they are parked at job sites for much of each workday. A truck is classed as retail if it is used to pick up or deliver property to or from individual households. An example is a van used by a dry cleaner for delivering clothing to individual homes. A truck that doesn't qualify for either service or retail use is classified as commercial use. An example is a truck used by a produce vendor to deliver fruits and vegetables to restaurants. Service vehicles are charged lower liability premiums than retail or commercial use vehicles. Likewise, retail use vehicles are typically charged lower liability premiums than commercial use vehicles. For example, Frieda's Floral delivers flowers within 50 miles of Frieda's shop. Because Frieda's truck does not travel more than 50 miles from her shop, her truck is used within a local radius. If Frieda's truck traveled between 51 and 200 miles, it would have an intermediate radius. Any truck that travels over 200 miles away is considered long-distance. Long-distance vehicles (other than light trucks) are subject to a special type of rating called zone rating. A vehicle that travels within a fifty-mile radius will generally be charged a lower liability premium than a comparable vehicle that travels a longer distance. Generally speaking, vehicles that travel long distances have a greater risk of accidents than those that travel short distances. The premium charged for physical damage coverage on a commercial vehicle is based the vehicle's age and its cost new. The cost new is the vehicle's initial purchase price. Age is important because claim payments for physical damage losses are calculated based on a vehicle's actual cash value (ACV). The ACV of a vehicle declines as it ages. Consequently, the premiums charged for physical damage coverage decline from year to year. The ACV of a vehicle is the most your insurer will pay in the event of a total loss. Age and cost new are not the only factors that affect your physical damage premium. Your insurer will also consider the vehicle's rating territory, use class, radius class, and size (GVW). Territory, use class, and radius class affects the risk of auto accidents. The rating territory may reflect an increased or decreased risk of theft losses. The size of the vehicle affects repair costs. Large vehicles generally cost more to repair than smaller ones. Physical damage coverage usually includes a deductible. The deductible represents the amount of each loss paid by the policyholder. As the deductible increases, the premium you pay for physical damage coverage decreases. The rating of private passenger vehicles is much simpler than that of trucks. The liability premium for a car is typically based on a flat charge. This charge varies depending on the rating territory. A "limits factor" is applied to the flat charge to reflect the limit purchased. The factor increases as the limit increase. The physical damage premium on a private passenger vehicle declines as the vehicle ages. The premium also declines as the deductible increases.